San Jose drivers are avoiding certain routes near Berryessa Road after their cars were hit by rocks. Sergio Quintana Reports. A San Jose woman's car was damaged by two large rocks while she drove along Interstate 680 over the weekend, and she later learned through her dashboard camera footage it was an intentional act. 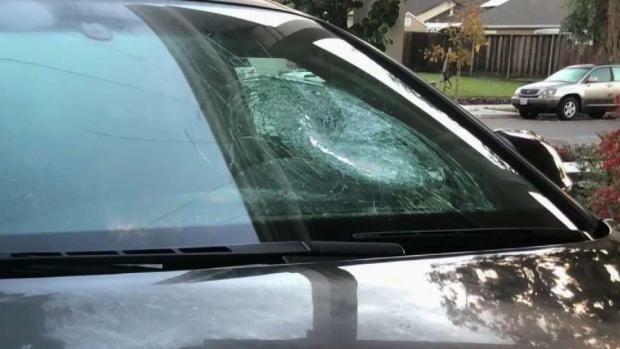 Li Deng was driving Sunday along I-680, near the Berryessa Avenue exit in San Jose, when two large rocks seemingly came out of nowhere and smashed into her hood and windshield. She immediately pulled over and called 911. "My mom and me were so traumatized. We didn't realize what really happened at that moment," Deng said, thankful she and her mother were not hurt. "My face, my body is just full of glass." Deng's dashcam was rolling at the time, and she looked at the video when she got home later. 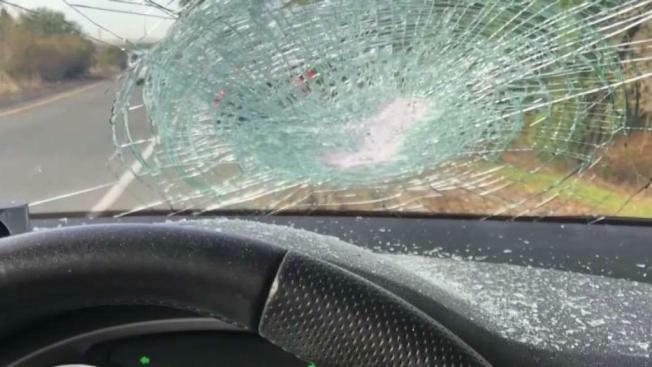 A San Jose woman's car was damaged by two large rocks while she drove along Interstate 680 over the weekend, and she later learned through her dashboard camera footage it was an intentional act. Ian Cull reports. "So we find out there's one guy throwing rocks," she said. A close look at the video shows a man in a light sweatshirt on the shoulder of the freeway, just off the exit, lobbing the two rocks toward Deng's car. The California Highway Patrol is investigating and searched the same site twice this week. Deng posted the dashcam footage to social media, where other people said it also happened to them. "Other cases from people who said they saw this guy did that before," she said. Deng worries the suspect could have killed her or another driver. She wants him caught. "Definitely, I want this guy to be arrested because I don't want any other people to get hurt," she said. Anyone who has experienced similar incidents involving rocks or who has seen someone throwing rocks from the shoulder of I-680 should contact the CHP. Such information also may help investigators track the suspect's movements.